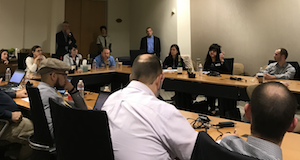 Last week, I had the pleasure of presenting to a group of educators and technologists at Fujitsu's Education Ambassador Summit along with a number of peers from Fujitsu, Microsoft, and the One-to-One Institute. Rather than extolling the virtues of one single product or idly prattling on about predictions on the future of technology in education, I chose to select three emerging technologies that are regularly affecting our lives outside the classroom and look at how leading-edge institutions are beginning to implement them today. Machine learning and artificial intelligence - specifically in the form of Chatbots. As one attendee put it: "Too often schools are usually five (if not 15) years behind the 'real world' in implementing the latest tech." While that is probably true in most schools, it doesn't have to be. Granted, not many school IT departments have the budget or the expertise to deploy every latest innovation. However, the latest "as-a-service" offerings from cloud providers such as AWS, Azure, and GCP provide low-cost, pay-as-you-go offerings that can make technologies like IoT or AI attainable for just about any school. 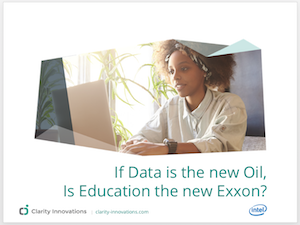 Enterprise solutions like Tableau or Microsoft's Power BI are great if you happen to employ a data scientist or analyst but, for the rest of us, there are other offerings (including Google Data Studio along with some of the visualization tools in Excel) that help take the information in your "data lake" and create visualizations and presentations that others can use. While IoT is busy transforming retail and creating smart homes and cars, the impact on education has been slow. However, transportation solutions to make "smart school buses" and even simple tools such as the AWS IoT Button are beginning to impact education. Their first effect may well be behind the scenes: transforming facilities and maintenance before in-classroom use. For users of virtual assistants like Amazon Echo or Google Home, talking to a device and getting an intelligent response is an everyday occurance. Similarly, text-based smart assistants in the form of chatbots are already being used in a variety of education settings. Microsoft's educator platform, for instance, includes a chatbot to help educators learn more about their offerings along with the technoloy-as-a-service that will allow anyone to create their own service. "The way we teach...is going to make our kids lose jobs in the next 30 years because machines will always do better...we have to teach our kids to be very innovative and creative. In this way, we can create jobs for our own kids."